Imagine yourself walking into your FLGS, box of board games under one arm, backpack full of micro-games, and you're ready to throw down some dice and cards. As you walk to the gaming tables, you see them. Yes, THEM. The war gamers. They dominate the room with their giant tables full of beautiful terrain, second only to the glory that is their armies. Finely painted, detailed, moving about in formation, advancing across the field of battle to bring pain to the enemy. DISCLAIMER: I have not played BattleLore 1.0 or Battles of Westeros. This is, in fact, my first Command & Colors game. I will not be comparing this to BL1 or any other C&C game and this will be the last time they come up in this review. If you have no idea to what I am referring, don't worry! Read on! 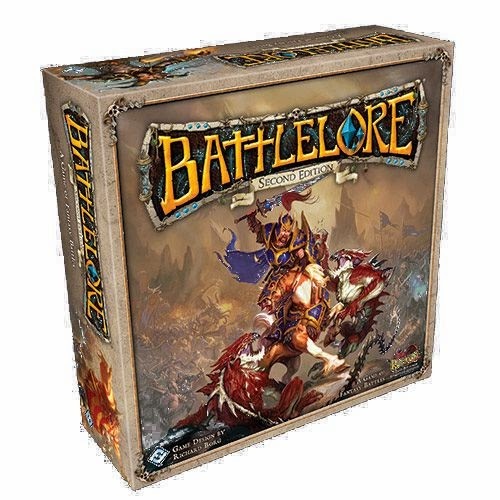 BattleLore Second Edition is a tactical miniatures game in a board game box. Designed and published by Fantasy Flight Games, the entire box features all you need for two players to sit down and have a great time (or several great times for that matter). Play goes back and forth as each player determines what troops he is going to activate, where he is going to move, and who he is going to attack. Each round players will vie for critical locations on the battlefield worth victory points and gain them at the end of their turn. The first player to hit 16 victory points triggers the final round and the player with the most points at the end of that round is the winner! Game setup is pretty involved, but the rulebook does a good job of streamlining it. You do the standard "gather tokens" step and then players pick their armies. I'll talk more about armies a little later, but right now let's stick to red and blue. With armies decided, each player will take their giant bag o' minis and various cards. These include scenario cards, deployment cards, lore cards, and unit cards. Players will begin with scenario cards - a card representing what their half of the battlefield looks like. Each player will choose one from three drawn scenarios (out of seven total for each army). The card indicates the placement of terrain, special rules applicable to the player, and any victory point conditions specific to that army. Scenario cards lined up to show both sides of the battlefield. From here, both players use the hexagonal cardboard tiles to setup their own side of the battlefield based on the layout presented on their respective scenario card. This includes lakes, rivers, forests, hills and buildings. The middle row of the map is shared with each player setting up the right half of the row. Once the board is setup, players can each place one ford in a river section on their side of the map. Determining first player is as easy as checking your scenario cards. There's a letter and number combination in the bottom left corner. The letter closest to A goes first and, in the event of a tie, the lowest number goes first. The next step of setup is mustering your army. In this step, both players have 50 mustering points to setup their forces. Each unit type is worth a certain number of points, Players build their armies using these points. You can have multiples of most units except the ones designated "legendary" (a general atop a large flying bird and a giant demon) though these are only limited because there's one of each in a box. Once forces are decided, players will take a deployment card corresponding to each unit they have in their army. This could be three archer cards, two cavalry, four infantry, and one legendary. They also take as many decoy deployment cards as they need so that, decoy and unit combined, they have 18. This is where setup gets interesting. On the scenario cards are blue or red highlighted hexes (depending on the color of your army) indicating where you can deploy your units - one per hex. Players lay out their deployment cards face down, placing units where you want them and decoy cards where you don't. When finished, both players reveal their deployment, remove decoy cards, and replace unit cards with the miniatures they represent. Secret deployment! If you don't want to muster your forces and do all that pesky math, the game does provide three pre-built army cards that you can use. Terrain and secret deployment - done! A selection of Command Cards. The final step of setup is to get your starting cards. There are two types of cards, command and lore. Command cards are played one per turn at the beginning of your turn and dictate what units you can move that turn. Lore cards, each unique to a specific army, are special abilities you grant to your units and you must spend lore, a form of magic power, to use them. You can only play one per turn (yours and your opponent's). To perform this step, draw six command cards and keep four, then draw three lore cards and keep two. Gameplay is relatively simple, but with a depth of complexity. Each turn starts with the playing of a command card. You'll have four to choose from in your hand. Its important, at this point, to note the red lines dividing the battlefield into thirds. Most command cards will show a generic view of the battle field with these red lines and feature a number and arrow in one, two, or three of the sections. These numbers indicate the number of units in those sections that you can activate this turn. The unit you activate is your choice, but you are limited to that many units in that section. This could be as few as two in one section in a patrol action or four across all three sections using the mighty wedge formation! A few command cards allow you to activate infantry units and take an extra move or archer units and make a bonus attack. There are many specialty command cards that don't fit the normal mold. After selecting a command card, the active player will nominate the units he is activating. Next, he will move all the units or choose to not move them. Units must all either move or not move before proceeding to the attack step. This is important because line-of-sight is a consideration. You don't want your cavalry to block the view of your archers! When making melee attacks, you must target an adjacent unit. Attacking into forests or houses have special rules that I'll leave you to discover. Attacking units at range requires that they be within a certain number of hexes (four for both archer units) and must be in line of sight. I'll avoid the crunchy line of sight rules and just reassure you that they are straight forward - if you can draw a line from the center of your shooting hex to the center of the target hex and it isn't blocked by another unit, forest, or house, you're pretty much good to go. There are some corner cases but they don't merit discussion here. Combat in this game centers around the attack dice. These dice have six symbols: a single sword, crossed swords, a bullseye, a crown, a flag, and a lore symbol (two floating crystals as seen in the accompanying picture). Each symbol designates a different result in the combat phase. Crossed swords and single swords indicate successful melee hits. If a unit is weakened (reduced to one health) only crossed swords continue to deal damage. A bullseye indicates a successful ranged hit. Ranged units are not affected by being weak (other than the fact they are almost dead!). The crown, also called heroic, is used to activate special abilities on your units. This could be causing poison or stunning an enemy unit. The flag indicates that you force your opponent to retreat. They will retreat directly away from the attacking unit a number of spaces equal to flags rolled. Units with a friendly unit behind them ignore retreats and units that cannot retreat (impassible terrain, board edge, etc) take damage instead. The lore symbol indicates you can take that much lore from the supply. Lore is used to power your spells and abilities on lore cards. Each unit will roll a number of dice indicated on their information card. If results can by used by multiple abilities you must choose which one you want to use. Dice can only be resolved for one ability each turn. Units are groupings of three miniatures and each mini represents one point of health. When the unit is reduced to one mini it is considered weak. Once damage is dealt, if the defending unit is still alive and still adjacent to the attacker, they can counter attack! The same rules as above reply. If the defending unit was pushed back, the attacker can advance into the empty space. Once combat is resolved, its time to tally victory points for the round. Most scenarios have hexes on the map marked with banners. When a unit holds a hex with a banner, the controlling player will get a victory point for it at the end of their turn. Every scenario also has a victory point condition unique to that player. This could be holding more hills than your opponent or keeping the board clear of enemy units around certain buildings. Only the player who used the scenario gets victory points for meeting this condition. All victory points are tallied and the active player collects the appropriate tokens from the supply. The phase ends with a little clean up - draw a command card to replace the one you played and choose to take either two lore, draw a lore card, or draw two lore cards and discard one from your total hand of lore cards. Lore cards for the demon-possessed! Lore is how magic manifests itself in BattleLore. Players have a unique lore deck and gain lore (points) used to play these cards. Each lore card has a triggering effect such as "play after your opponent's movement step" or "play before an attack is rolled". If you meet the triggering effect, just discard the appropriate number of lore tokens and resolve the card. It is then discarded. Lore cards of the Daqan Lords. Lore offers many powerful effects like being able to counter an attack before retreating or being able to use single swords as damage triggers - even if you're weak or ranged! Properly managing your lore cards is crucial to winning. Imagine holding a crucial victory point location and your opponent is able to force you off with a retreat and advance into the location to claim it himself on his turn. But just before you retreat, you play "Counterattack"! allowing you to immediately counter him before retreating. The result? You wipe out his unit and he cannot claim the spot or the VP! If you are new to miniatures gaming, this game is a great entry point. Its full of great looking minis on a smallish scale (slightly less than the common 25mm). The plastic is board game plastic (think Zombicide) which is softer and more prone to...sagging? If this bothers you, there's an easy fix: dip the affected appendage in some hot tap water for a few seconds. The plastic will heat up and you can gently bend it back into position. Let it cool naturally. The board is large and quality. There's some very minor warping but that is often a regional issue and heavy enough to self correct after a few minutes of being on the table. Personally, I'd love to get one made of playmat material instead of card board - roll it up and go, less slippage. The terrain are individual hexes with forests, houses, trees, and rivers painted on them. The art is nice, albeit generic, and the hexes are good and thick. No warping to be seen. The cards are standard FFG stock and I always sleeve them so I can't comment on durability. One downer, but a necessary evil in this game - I hate mini board game cards. The tiny, basically half size cards that FFG seems to have a fascination with. In BL2, they are purely used as deployment cards. I say "necessary evil" because any other size would be too large. The scenario cards are FFG's tarot size and very nice to look at. All other cards are standard card size (think poker or Magic cards). For those who wish to paint the minis, this is definitely possible. The plastic is not so soft that it won't hold paint well. Just be sure to prime them first! If I were to ever paint mine (unlikely - I've painted more points of Space Marines than I can shake a stick at) I'd repaint the bases in their original red and blue just to keep things clean on the field. Yes, my favorite part about any game - more of that game. I am a self professed "expansion fanatic" and I'm okay with it. Luckily, BattleLore Second Edition is primed for expansions. The game takes place in the Terrinoth world - FFG's token fantasy IP. It's also home to Runebound, Runewars, RuneAge, and Descent Second Edition. There is a great deal of world ready to be incorporated into BL2. As of this entry, no expansion has been announced yet, but speculation is rife and extends from the addition of new units to the two existing armies (Daqan Lords and Uthuk Y'llan) to a second big box expansion featuring additional races. The sky truly is the limit for expanding BL2, its just a matter of how high FFG decides to aim. There's not a great place to include this, but I should mention that FFG has created an Online Scenario Builder that you can use to create custom scenarios for your games. This is a fantastic resource for those with a creative mind for this kind of content. Its provides everything you need to build and print scenarios to play at home. You can even designate specific unit placement or build entire battlefields - not just one half for a single faction. Even if you aren't interested in custom building, the builder is also a repository for all the scenarios already made including those made by FFG. Its like a free DLC for a board game! Fair warning - you'll need an FFG Community account in order to login and use it. Well, needless to say, I'm a big fan of BattleLore 2.0. Two player games with interaction are one of my favorite types of board game (the other being worker placement with minimal interaction) and BL2 fits this mold perfectly. The gameplay is very simple and the use of command cards cuts down on a lot of the decision making. You aren't stewing over X choices of all your units to act with. You are limited to X in a zone and you are forced to make a decision based on your limited resources. Lore gives the game the "BANG" it needs to add those exciting turns when your opponent drops swarms on you, ruining your line of sight, or decides to add some teleport gates and send one of his units clear across the field and into combat in one turn. A big plus to the game is that it comes with two books - a resource book and a separate rulebook. The rulebook is used for your first game. It comes with a pre-made scenario that tells you where to put everything and makes it super simple. Just follow the instructions until it tells you to stop and then have fun with a basic game. The rest of the rulebook explains more stuff in depth once you have your legs under you. The resource book is basically an FAQ and index in one. On crack. Its a terrific thing to have once you understand gameplay and get into some of the more strange interactions. One annoying thing is the setup time involved. It really is a good 5 - 10 minutes of setup before you get to gaming. Digging everything out of the box, sorting cards, passing around cards and bits, picking a scenario, sifting through terrain, building the scenario, mustering your army, laying out deployment cards, swapping them out for models. Like anything, it gets faster with practice, but nothing speeds it up like a strong storage solution (i.e. not mine). Plano boxes beats plastic baggies any day. Don't let this shake you though, once it is set up, the game pays dividends and more. So next time you walk into your FLGS, walk past those wargamers with your head held high! While they are still arguing about whether or not their terrain setup is balanced, you're rolling dice. When they drop their twenty year old metal mini with chipping paint and the arm flies off, you'll shake your head and smile as you pick yours up off the floor, arm intact. When you're packing up after a hard fought victory, they'll still be sifting through bags of bubble wrap to find the commander they thought they deployed. Step forward, gentle reader, step forward into the realm of wargaming - faster and cheaper than you ever imagined! The Roc Cavalry makes plans to assault the Demon Lord. Archers prepare to loose their arrows on the unsuspecting foe - better claim that VP spot first! Obscenes and Fleshripper Cavalry are getting into position to smash some lowly footmen! Check out the men of Miami Dice as they review BattleLore Second Edition. Here's a Drive Thru Review of BattleLore Second Edition. Curious about the differences between BL2 and BL1? Check out Jon Brown's review here. Donny is a music educator in the suburbs of Dallas. He has an obsession with all things Star Wars and, when asked what he wants to do, will always respond with "board games". You can find him at Nerd Night events in the Dallas area, Dallas Games Marathon, or at his second home, Madness Games & Comics. He spends far too much time on social media, be it Facebook or Twitter, and comments or suggestions can be directed to his email.